One of the problems of Intel’s high end desktop platforms is size: the sockets are large, and all the DRAM slots take up a fair amount of space. Couple this with the PCIe lane potential of the CPU, then restricting the motherboard size smaller than ATX limits the number of features and multi-PCIe capabilities afforded by the platform. Nonetheless we saw a couple of motherboards for X79 move down to the micro-ATX size, as well as a few system designer builds that offered other sizes. 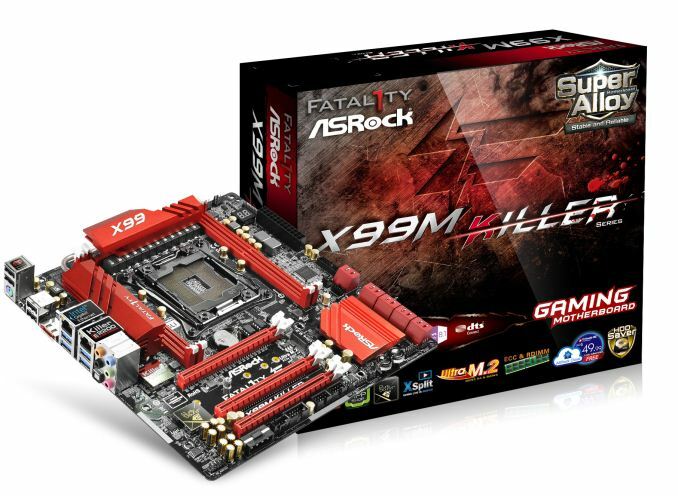 In that vein, ASRock is moving from its X79 Extreme4-M (our review) and sent us pictures of the upcoming X99M Killer. One thing that a micro-ATX layout does is free up some of the PCIe lanes for extra controllers. The X99M Killer will have ASRock’s Ultra M.2, giving PCIe 3.0 x4 bandwidth for devices up to 22110. Being part of ASRock’s Killer range we get an E2200 series network interface, which also incorporates an EM shield similar to the Purity Sound 2 upgraded audio. The Killer NIC is paired with an Intel NIC as well, with the Fatal1ty Mouse Port also appearing. Due to the size, if any other mATX motherboards are released I would assume that like the X99M Killer there will only be four DDR4 memory slots, and here ASRock have used thinner slots in order to fit the power delivery and other features on board. I count five fan headers on the board, along with ASRock’s HDD Saver connector and ten SATA 6 Gbps ports. I can just about make out that some of these are labelled SATA3_0_1 and some are labelled 5_SATA3_0_1, perhaps indicating the presence of a controller or a hub. There is also a USB 3.0 header on board with power/reset buttons, a two digit debug, two BIOS chips, two USB 2.0 headers, a COM header and additional power to the PCIe slots via s 4-pin molex. We also have an eSATA on the rear panel, with a ClearCMOS button. We can make out the final PCIe slot as having only four lanes of pins, suggesting an x16/x16/x4 layout. Whether these four lanes are from the CPU or the chipset is unclear, especially with the presence of the PCIe 3.0 M.2 x4 slot in the middle. The box lists XSplit, indicating a bundling deal with the software, as well as ECC and RDIMM support. 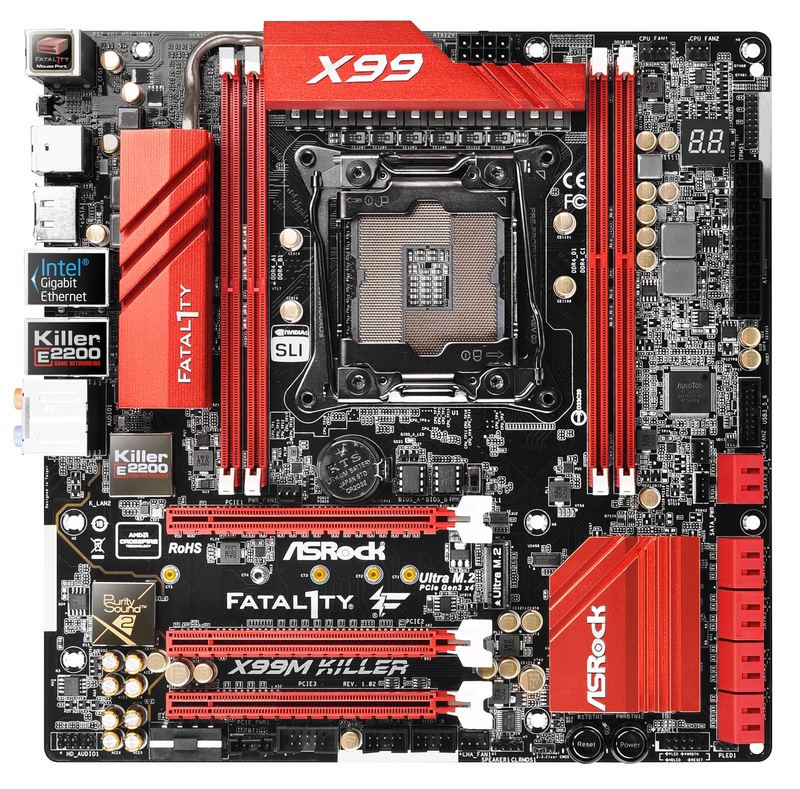 I believe the X99M Killer will be due out at launch, or relatively soon after, although ASRock has not released the pricing details yet. M.2 3.0x4 is a must on a new platform at this cost. 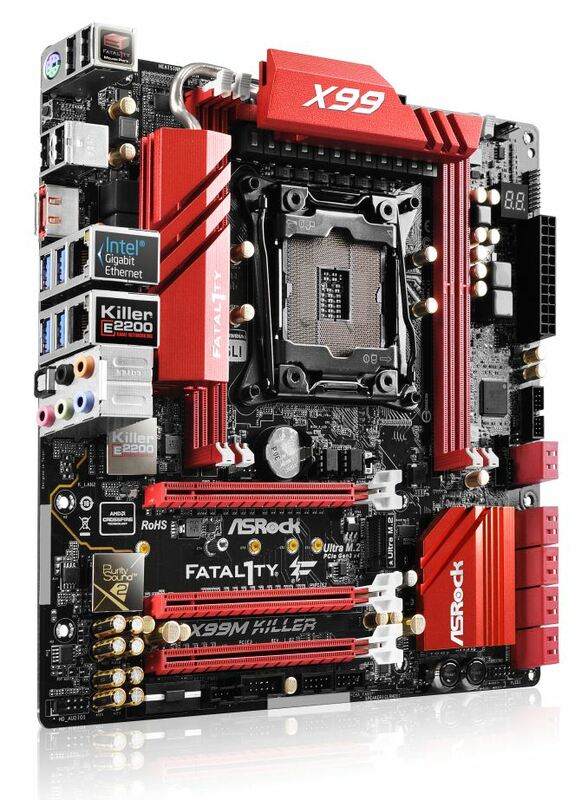 Way too much red.. Why every manufacturer puts these colors (I could paint the heatsinks, but the PCIe slots and the ram slots are red too). Also the gold caps would bother me a lot.. Hope there will be more than just this and ROG mATX X99.. there wasn't enough choices on x79 mATX.. So much red. I like it. Although one thing comes to mind; Why is nobody offering white pcbs anymore ? ECC and RDIMM support? Now that is interesting as these features have been tied to Xeon chips. Granted, the previous generation X79 could support these technologies when a Xeon chip was put into the socket, though most motherboard manufactures never bothered to run the extra traces to the DIMM slots.